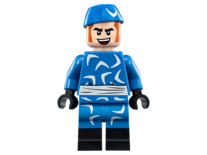 Captain Boomerang is a DC Comics Super Heroes minifigure released in 2016. He will be released in 2018 as part of the The LEGO Batman Movie theme. Initially a boomerang promoter and salesman working for his father's toy company, George "Digger" Harkness, alias Captain Boomerang, is an enemy of The Flash. 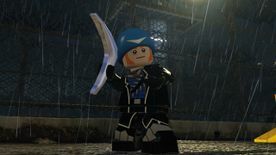 In console versions, Captain Boomerang has a cameo in LEGO Batman 2: DC Super Heroes. Just before The Flash leaves for Gotham, he is seen defeating Captain Boomerang. Captain Boomerang is also one of the criminals hidden around Gotham City and can be found at Arkham Asylum. He is unlocked for purchase after his defeat and costs 100,000 studs. 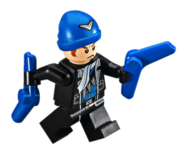 In portable versions, Captain Boomerang is an unlockable character. His minikit is found in the level Assault the VTOL. He costs 200,000 studs. In the game, Captain Boomerang is a member of the Squad along with Amanda Waller, Deadshot, Deathstroke, El Diablo, King Shark, Harley Quinn, and Katana. Captain Boomerang was voiced by Nolan North. He also voiced Scarecrow and Hush, as well as providing additional voice work for LEGO The Lord of the Rings: The Video Game and Deadpool in LEGO Marvel Super Heroes. This page was last edited on 16 December 2017, at 15:04.